Understanding your credit rating is very important when it comes to borrowing money. Your credit score rating is used by anyone who is lending you an amount of money or property, such as banks, mortgage companies, landlords, etc., to check for potential risk. A credit rating often tells a lender how trustworthy the debtor is with making payments. This is less about the debtor’s personality and more about their financial history and stability. In the event that a lender comes across a potential borrower who has a low credit report rating, the lender can decline the loan and avoid risking a default (when the borrower cannot repay the borrowed funds). The credit scoring is created through credit agencies, some of which are more widely used than others. Have you ever heard of a FICO score? That is a credit score created through FICO, or the Fair Isaac Corporation, a very popular credit company that provides the software that credit agencies use to calculate your score, and each credit agency takes into account several factors with their report. The 3 top credit reporting agencies (or credit bureaus) use FICO software to calculate a person’s score. These 3 bureaus are TransUnion, Equifax, and Experian. Each credit bureau keeps a file about you that includes various information necessary to calculate credit. For different types of lending, each bureau may produce a slightly different FICO score. As an example, in mortgage lending, Experian will likely provide FICO score 2, Equifax will provide FICO score 5, and TransUnion will provide FICO score 4. So why are there multiple FICO score versions and why do the main bureaus use different ones to do the same job? The way credit has been used over the past few decades has fluctuated and evolved. In order to keep up with this, the way credit scores are calculated has also needed to adjust, and with each new adjustment, a new FICO score version is created. Each lender and company decide whether or not it will upgrade to the latest version, so some lenders operate with an older version than others. Even so, this is nothing to get too worried about since all versions will produce relatively similar scores. Each bureau allows you one free credit check a year, but when you need to check your credit more frequently, there are credit monitoring products. These enable you to check whenever you want, and you’ll receive alerts if there are changes in your credit, which is a big help to anyone who occasionally forgets payments. A credit score is often associated with lending risk. Why? Think of it in terms of a friend borrowing money from you. You need that money to get back to you, and if you knew that your friend was buried in multiple other debts that he or she couldn’t pay off and they didn’t have a very good history of paying back other friends, you would be less likely to lend them money, right? The same is true for banks and other lenders. They need a method to easily, efficiently and fairly determine a person’s creditworthiness. A credit report and credit score do just that. The range for FICO scores runs from 300 to 850. The higher the score, the better the credit and the lower the risk. With a lower score, the opposite is true. The principles to keeping your credit score up are simple, but the application can be a little trickier, especially if you run into tight financial times. 3 key rules to maintaining good credit include keeping credit card balances low, consistently making payments on time, and only opening a new credit account when you really need it. The reason why these rules are so effective is because of the 5 categories that FICO calculates: amounts owed, new credit, payment history, length of payment history, and credit mix. A credit report is everything that goes into the 5 categories mentioned above while the score is the number calculated from the report. A credit score is very different from a credit report, and the two should not be confused. Many VA lenders will place overlays (or additional rules) on their loan requirements that dictate the lowest credit score they will allow a borrower to have. However, the VA itself has no specific rule about minimum credit scores. 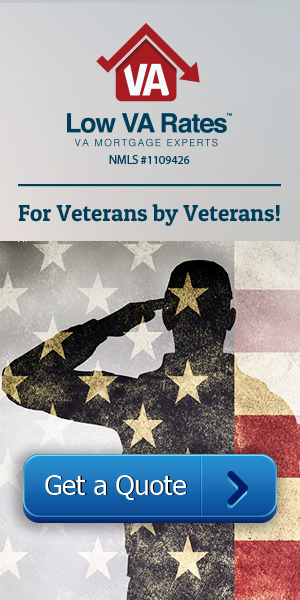 At Low VA Rates, we follow the VA’s lead and also have no minimum credit requirements. That doesn’t mean we don’t take your score into consideration, but we understand that a good score doesn’t always make a borrower good and a bad score doesn’t always make a borrower bad. Call us now to get a quote on the lowest interest rates you can get with your credit.